Around noon today, I officially concluded my 31 days of Project 31. I’m still here, though I’m no longer strictly adhering to the rules I’d setup for my month-long challenge. One of the first things I did was to start up my car, just to make sure the battery still had enough juice (I hadn’t bothered charging it during Project 31). It started up just fine, so I know I can get out any time I feel like it. About the only other change is that I’m back to drinking tap water I previously hauled in from town. I’m out of clean snowmelt, and I’m not entirely certain the months-old water I’ve been drinking for the last few days is actually all that clean. Anyway, I’m sure I’ll be writing a few posts about Project 31, but in this post, I’ll report on how things ended up in terms of water, food, fuel, etc, etc. I succeeded in meeting my goal of only using water I’ve harvested on my property. The weather was very cooperative, and despite weeks of completely dry weather leading up to Project 31, I got a nice snow storm on Day 0. 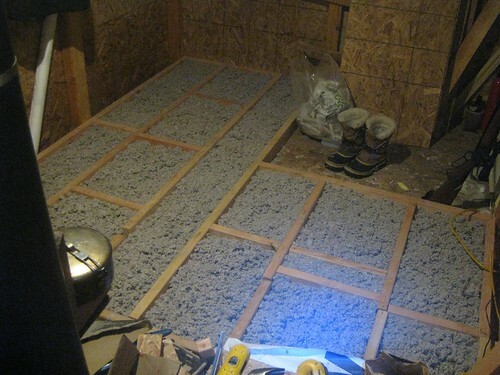 All told, I got probably about 24 inches of snow during the first half of Project 31, so I was able to harvest plenty of snowmelt by packing snow into a pot and melting it on my wood stove every night. Most of the snow on the ground had disappeared by last week, but I had enough filtered snowmelt stored to last me up until 2-3 days ago, when I switched to my “backup” source: water from a bin I’ve had out for months. My stomach got a little upset yesterday, and I’m suspicious of the water. While snowmelt is unlikely to harbor biological contaminants, the water in that bin has been exposed to the elements for months, so it’s possible it might’ve picked up some bugs. The water I drank had been filtered previously and placed in an unmarked container, so it wasn’t until after I drank the water that I remember where it’d come from. In the future, I think I should be a little more careful about marking potentially contaminated water so I don’t forget to boil it first. My food stores did remarkably well, and most things lasted far longer than I’d expected. I still have some fresh vegetables left (some potatoes, one red cabbage, a butternut squash, about a pound of brussels sprouts) , and ate the last of my fresh meat for dinner tonight. The only losses to spoilage were one zucchini, one sweet potato, and bits of a couple of tomatoes (most of which remained salvageable). So, considering how I didn’t use any refrigeration other than a couple of coolers, that’s not too bad. Of course, average temperatures of around or below freezing certainly helped keep things fresh. I’m also happy with the variety of food I had. Even though I haven’t eaten out in a month, I’m not really craving anything, which is a bit surprising. I guess cravings, whether we know it or not, may often be triggered externally. For example, next time I go out to the city and see signs for all kinds of restaurants, I might suddenly crave fried chicken, or sushi, or chinese food, or greasy diner food, or…. But, here, away from such temptations, I’m perfectly happy with what I have/had. In terms of quantity, as I’d initially predicted, I ended up with a surplus. I hardly touched any of the non-perishable foods, I still have a dozen eggs, a loaf of bred, a small stack of tortillas, most of a 2-pound block of cheese, an entire block of salted pork, and the vegetables I mentioned earlier. Overall, though, I’m glad I had an overabundance of fresh ingredients because the threat of spoilage compelled me to cook and eat fresh cooked meals. I wish I’d brought less meat, especially since I had so many eggs, and I think I could’ve done without bread. I was able to bake scones, so I’m pretty sure I would’ve been able to bake other bread-like substances as well, if I had to. I started off with just my 100W solar panel, then setup the 45W panels part way in. For the most part, that was enough power, and my battery array generally stayed well above 12V, usually in the 12.3-12.6 range. That all changed in the last week, when I started spending a lot more time on my laptop to follow the news from Japan and keep in touch with my family. It’s also been mostly overcast this past week, so with those two factors combined, my power deficit skyrocketed. I decided not bother conserving power too much because I knew Project 31 was almost over, and estimated that I had enough reserve power in my battery arrays. My estimation was off by a day, and my battery array got down to 11V last night, at which point my inverter shut down. Mostly, that just meant I had to stop using my laptop, and to some degree, that was a quality of life improvement. I lit candles, switched to battery-powered lights, listened to music on my battery-powered iPod speakers, and read a book instead of obsessing over the news. At this point, I think there are two ways to think about this power outage on my last day. Most people will probably say that I ran out of power. The other way to think about it is that I used too much power. The solution changes depending on which perspective you take. If I ran out of power, then I need more power (i.e. add more generating capacity). But if I’d used too much power, the solution is to simply use less. I’ve considered getting something like an iPad, which would use less power than a laptop. Ironically, though, for the price of an iPad, I could buy another 200 Watts of solar panels. The third option is to buy neither, continue to use my laptop, but to use it less. So, actually, there are 3 options: increase efficiency (buy an iPad), increase energy supply (buy more PV), reduce consumption (read more books). Gasoline – Didn’t use a drop. Yay! Propane – Used about 2.5lb, so a little more than my goal of 2lb. Heating – Only burned wood from my property. I ran out of chopped wood in the last week, but had plenty of wood in 2-3ft lengths stashed under my hut that I had to cut to 6-8″ lengths. It’s been too wet for the last couple of weeks to harvest more wood, though there were a few days in the middle when I was able to shore up my supplies. Using my cordless saw to chop wood became a problem towards the end though, when I started running low on power. I’ll definitely be getting a bow saw, as many readers suggested. Hut 2.1 proved to provide adequate shelter during this very wintery month. During Project 31, there were 3 winter storms, with snow accumulation up to 16 inches, temperatures down to -10F, and winds gusting up to 45mph. Through it all, Hut 2.1 kept me warm, dry and happy, and that’s about all you could ask for from a home. 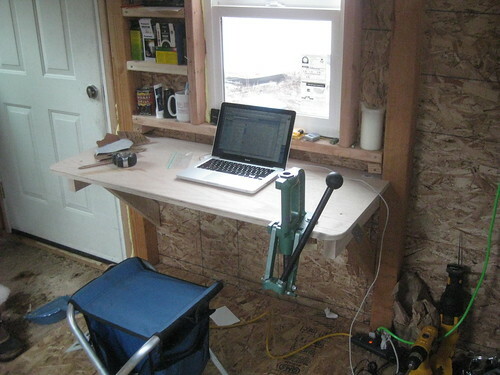 Improvements made during Project 31 include the raised insulated floor, the kitchen, and a desk. The only major project I didn’t get around to was the kitchen sink. I’d originally planned on putting a bathroom inside Hut 2.1, but decided that I’d rather have more open space in the hut than a bathroom. 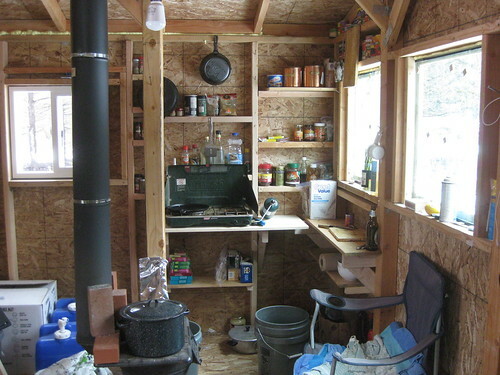 The outdoor composting toilet suffices for now, though I might put a roof over it so I don’t have to do my business in the snow. I was somewhat ambivalent towards having an internet connection for most of Project 31. 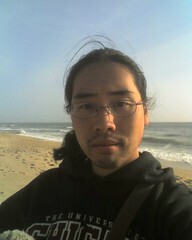 On the one hand, it allowed me to update my blog and upload pictures. I also occasionally chatted with friends, and I think that was enough to keep me from getting lonely. On the other hand, I ended up spending way more time on my laptop than I would’ve liked. I read far fewer books, and probably spent less time outside than I would’ve otherwise. During this past week, though, I’m glad I had an internet connection, even if I used it to follow news a bit more obsessively than was probably necessary. If I were out here without access to information, I probably still would’ve heard about the earthquake and the nuclear disaster, but I wouldn’t have been able to stay up to date, and I know that would’ve driven me nuts. I’m also glad I was able to stay in touch with my family. I can’t think of another time when I exchanged as many emails and Skype calls with my family as I did this past week. Over all, I think I’ll keep the internet connection, and try to find other ways to moderate/regulate my usage. So, this is an open problem for now. Personal hygiene is overrated. I took a shower once during Project 31, when it got warm and I got a little sweaty. But, other than that, I haven’t really had the desire to bathe. I don’t know of any other animal that bathes obsessively like humans do, and frankly, I don’t think it’s actually healthy. In my experience, there are 3 parts of your body you need to keep clean: your feet, your hands, and your mouth. If left alone, your feet can practically rot away, dirty hands could be a problem if you use them to eat or prepare food, and you’ll lose your teeth if you don’t brush and floss regularly. But just about everything else takes care of itself. … will be posted in another post. My laptop is almost out of power, so I’m just going to post this. 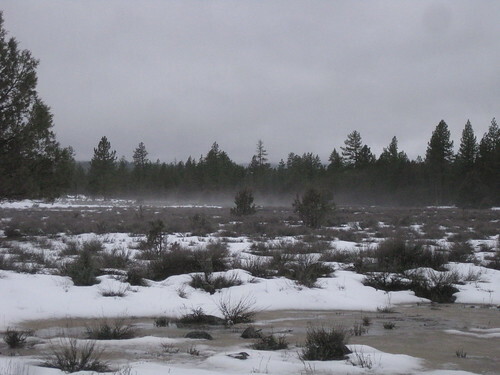 A couple of days ago, I decided to hop over the fence separating my property from public lands to the west, to go walk to Lassen National Forest, which starts just half a mile down a forest service road. On the way, I planned on checking out a pond that’s located a couple hundred yards from the barbed wire fence. As I approached the fence, though, I heard a whisper. I undid my hood to uncover my ears. There was no mistaking the sound — the sound of trickling water! I scrambled downhill towards the bottom of the ravine where I knew the sound must emanate from. The whisper turned into the full-on susurration of gushing water. The seasonal stream was running! Even though I’d always suspected the presence of a seasonal stream there, the sights and sounds stirred palpable excitement. Water! Gallons and gallons of water, gushing right through my property! The sudden appearance of this body of water made it seem that much more magical. Though, in reality, the stream’s appearance could hardly be attributed to magic. In fact, the pond that I had been planning on visiting sits upstream from this creek, and is the very reason I suddenly started receiving water. The pond is actually the result of a large earthen berm that blocks that stream. When the water level rises high enough, the dam is flanked, releasing any additional water downstream towards my property. The timing of its release is also unsurprising. It had snowed almost 2 feet over the past few weeks, but recent warm weather accompanied by rain had caused all that snow to suddenly start melting and rush downhill. 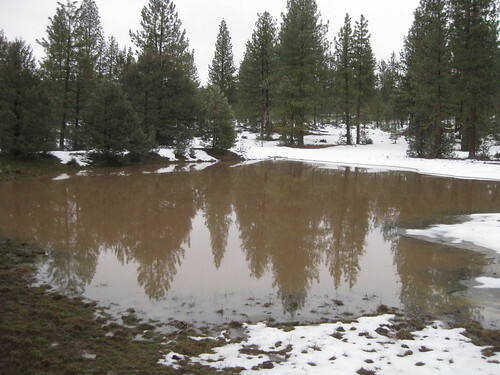 When the pond filled up, the overflow started trickling through my property. Once all the snow is gone, probably in the next month or so, the stream will also stop running. But during that short window, snow melt from hundreds of acres of land will rush through that narrow gully on my land. Exiting my property to the north, the creek eventually joins other tiny streams heading towards Pit River, which meanders west across the mountains to empty into Lake Shasta, to then continue south down the Sacramento River, eventually spilling into the Pacific Ocean where it would evaporate, condense into clouds that get blown back east, and fall as rain and snow on these same mountains to repeat the cycle. On the way, some of it may be diverted to irrigate the rice fields and orchards in the Central Valley. 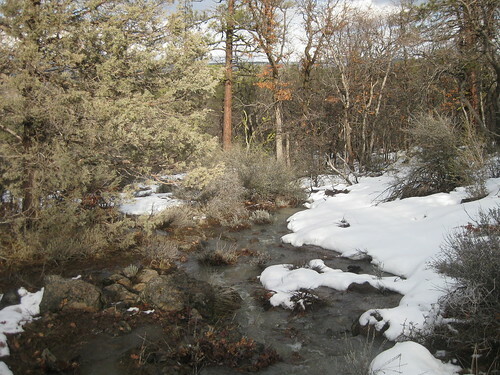 So the next time you eat California-grown rice, or olives, or almonds, or perhaps fruits, you may be eating a tiny bit of that snow-melt I saw flowing through Serenity Valley. Living here, I’ve gained a much deeper appreciation for water. Water is life. People talk about the “gold standard”, but I think there should be a “water standard.” Water is what makes life possible. No water, no life. And until recently, I mostly thought of Serenity Valley as an inhospitably dry place. Indeed, from late Spring until mid-Autumn, there’s hardly any rain. In the summer, it’s typical for there to be zero precipitation for months. Last year, I had to haul water in to irrigate my tiny garden, and even that wasn’t enough. But, lo! When I saw all that water gushing through my property, I felt like I’d struck gold. Nay, I felt like I’d struck life. If I can contain even a tiny fraction of the water, life can flourish on Serenity Valley. I can grow a much bigger garden, and even grow fruit trees. I can raise livestock. I may even be able to raise fish! It’s so dry here in the summer that things don’t even compost very well, but water changes that too. The soil isn’t great, but, as long as there’s water, I could build it up. 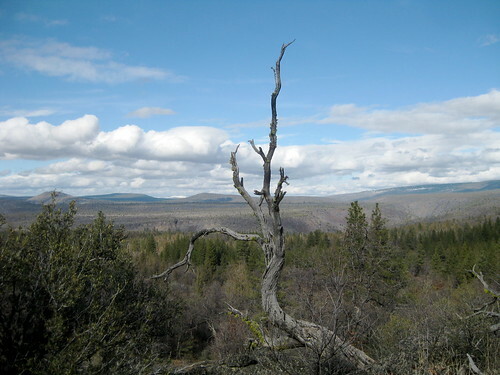 When I bought this land, I hadn’t really considered the possibility of homesteading here. Now that I’ve been contemplating that option, I was starting to doubt the suitability of this land for sustaining life. That changed the instant I heard that stream. Sure, there are much easier places to homestead, where growing seasons are longer, or summers aren’t so dry, or the soil is better. But with all that water, I think it’s at least theoretically possible to turn this land into a productive little farm. It wouldn’t be easy. It’d be an uphill battle all the way. But it just might be possible, and that’s pretty darn exciting. 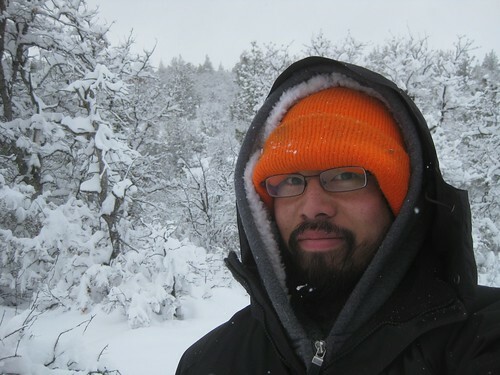 As new possibilities blossomed in my imagination, I continued with my walk to Lassen National Forest as planned. I was tempted to spend more time around the new creek, but reasoned that it would still be running for at least a week or two. 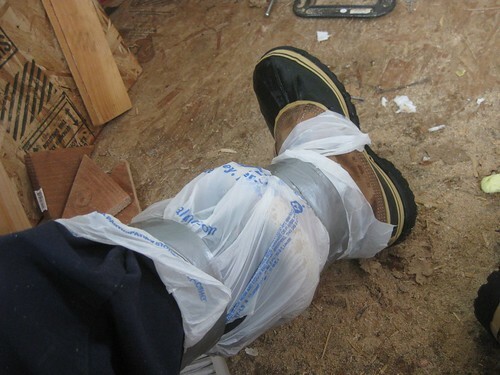 The next day, having slept off my aquatic euphoria, I turned to more practical considerations. I started by walking the entire length of the creek, following it all the way through my property and out. The goal was to get an idea of the creek’s path, and to gain a better grasp of the terrain surrounding the stream. For the water to be usable during the dry season I would need to collect it, either with a dam of my own, or by diverting the water to a cistern. My hope was to spot potential sites for one or the other. After entering my property from the west, a few hundred yards north of the south-west corner, the creek rushes down the steep ravine that I mentioned before, at a east-northeasterly orientation. The ravine eventually opens up to a bigger valley, the one I think of as actual Serenity Valley, which slopes gently down almost due north. The creek gradually wanders to the east, flowing out my property lines, then continues north parallel to my eastern border, eventually pooling in a flat area near the paved road, before disappearing into a large duct under the road just yards from the peg marking my north-eastern corner. As I walked the length of the creek, it became obvious that damming a considerable quantity of water would quickly become a monstrous logistical and engineering feat, probably beyond my budget or skills. A more practical and practicable solution seemed to be to set up a small dam, maybe just a foot or two high in a natural bottleneck, to raise the water level just enough to make water collection easier. From there, some of the flow could be diverted by a series of pipes to a cistern located in a reasonably flat and clear area about 100-150 yards away. The terrain would allow the cistern to be located at a slightly lower elevation, and could be fed by gravity. But, is there enough water? So, even if I over-estimated or under-estimated by 100%, we’re looking at hundreds of thousands of gallons on the lower end, and well over a million on the high-end. It seems that diverting 10-20,000 gallons would hardly do any harm, yet would provide me with enough water to irrigate a large garden, raise a couple of heads of cattle, with maybe even enough left for a small fish pond. But, would that be legal? My natural inclination towards such questions would be to ask, “Does it harm anyone?” If not, who cares? 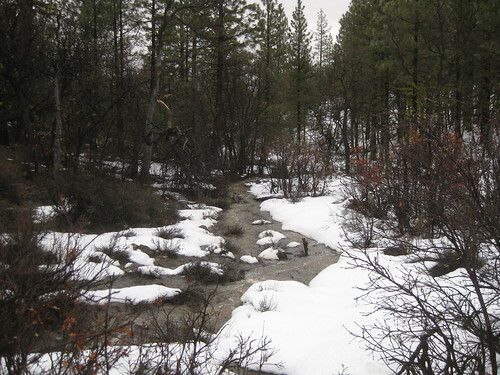 After all, diverting 0.5-5% of a tiny seasonal creek seems pretty harmless. Being a seasonal creek that only exists for a few weeks a year, there’s no native fish or other wildlife I need to worry about. I’m not dumping toxins downstream. So, it seemed like it’d be something so harmless as to not even warrant regulation in the first place. But then, this is California. And this is water we’re talking about. I decided to begrudgingly research the legal ramifications, half expecting to find that what I wanted to do would be bound tightly in red tape. There is one exception to the requirement that you have a water right. You do not need a water right if you take and use a small amount of water only for domestic purposes or use a small amount of water for commercial livestock watering purposes. 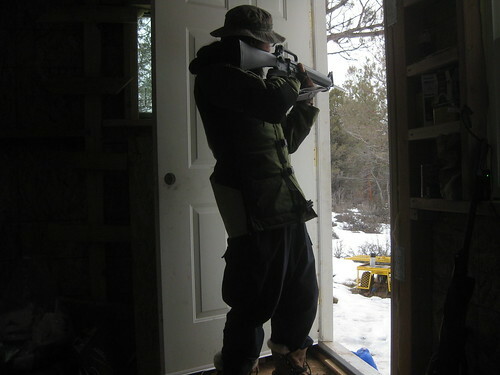 However, you are required to register your use with the Division of Water Rights, notify the California Department of Fish and Game, and agree to follow conditions the Department of Fish and Game may set to protect fish and wildlife. The maximum use allowed under such a registration is 4,500 gallons per day for immediate use or 10 acre-feet per year for storage in a pond or reservoir. … indoor household uses, watering of non-commercial stock used for the household, and irrigation of one-half acre or less of household land, such as a garden. One remaining open question is the cistern. My first thought was, of course, a DIY approach. A 10,000 gallon cistern could measure 15x15ft filled to a depth of 6ft (7.48 gallons fit in 1 cubic foot), and a 15x15x7ft box with 6″ walls would require about 41 yards of cement at a cost of probably $5000-7000 (though there’s also the question of how I’d get a cement truck out there). Even if reinforced with rebar, 6″ walls may not be sufficient, so that may be a low estimate. After doing some research, it seems above-ground plastic tanks may actually be more cost effective. They seem to be priced around $0.50/gallon (+shipping) or lower, and come in varying shapes and sizes so I could start with a small tank and add more. Being fully enclosed, evaporation wouldn’t be an issue either, and the bigger ones have man-holes for cleaning (the water is pretty murky, so I suspect there’ll be a fair amount of sedimentation). Another related idea I had was to set up a micro-hydroelectric generator to run a pump, and lift the water to a higher elevation that way. About the only good that would do is to open up more possible locations for the cistern. But using the creek to generate power wouldn’t be practical for much else, since it probably only runs for a few weeks out of the year, and the creek is about 300 yards from my camp. 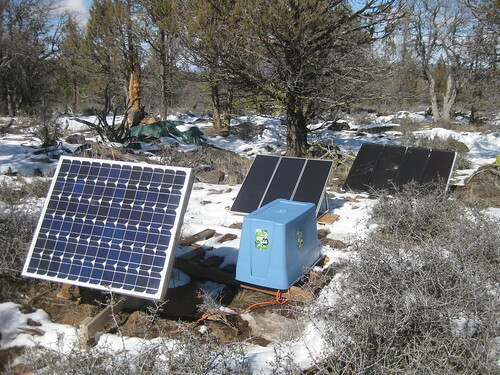 Re-capturing energy when water is released from the cistern might be feasible, though it’s just as likely that water from the cistern would need to eventually be pumped higher since most likely locations for gardens are located higher up on my property. All in all, preliminary indications are promising. If water-flow I’m seeing now is fairly typical, diverting about 10,000 gallons seems both legal and practicable. 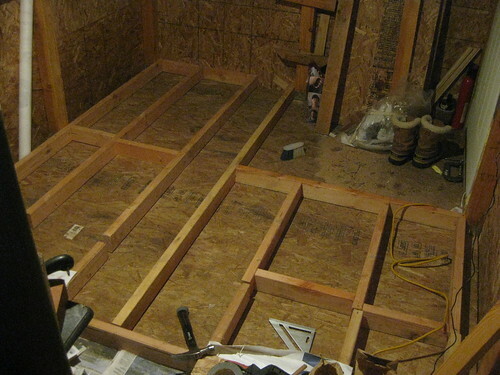 Tentatively, I may try to setup a small test this summer, and see how it does next spring. I could start with a cistern or tank in the 1000-2500 gallon range, and scale-up if that works out. As they say, Rome wasn’t built in a day, and if Serenity Valley is to see a transformation into Serenity Valley Farm –still a big if, mind you– it’s going to take years, if at all. I think today is day 15 of Project 31, which means I’ve been up here over two weeks now including the two days that preceded Day Zero. I’ll be posting a mid-term report in the next couple of days, but today, I’m going to devote a whole post to the topic of food. I might’ve missed a couple of things, but that’s most of it. That list also only includes food I bought immediately prior to Project 31, but doesn’t include the larger list of foodstuffs I already had here and have been consuming. For instance, on Day Zero, I had half a dozen eggs and most of a loaf of bread still left over from January. There’s also things like instant coffee and other powdered drinks, as well as spices. So, for the most part, I’ve found that I have pretty much everything I need or want, and about the only things I noticed missing are ginger root, and cooking wine (red and white). With that said, if it seems like a rather long list, well, it probably is. As I said elsewhere, my goal wasn’t to just buy the cheapest food to sustain me for a month, but to have a decent variety and mix of fresh and preserved (or preservable) ingredients. My desire to have fresh foods also introduced a level of uncertainty, since I wasn’t sure how long fresh vegetables and meats would last, and it also meant I had to buy a decent quantity of less perishable foods in case the fresh stuff didn’t last as long as I’d anticipated. For instance, in addition to 6.5lb of fresh meat, I also got about 5lb of various cured and salted meats (bacon, sausages, etc) which have longer shelf-lives, which were in turned backed up with assorted canned protein. With vegetables, I mixed in hardier vegetables like winter squashes and potatoes with vegetables that I knew wouldn’t last long (mixed greens, for instance), and also got canned vegetables as backup. So, that necessarily meant that I had to get more food than I’d strictly need, mostly for the sake of fault-tolerance. After all, I’d rather have too much food, than too little. So far, my food stores have survived better than I’d feared, mostly thanks to the colder-than-average temperatures of the past couple of weeks. 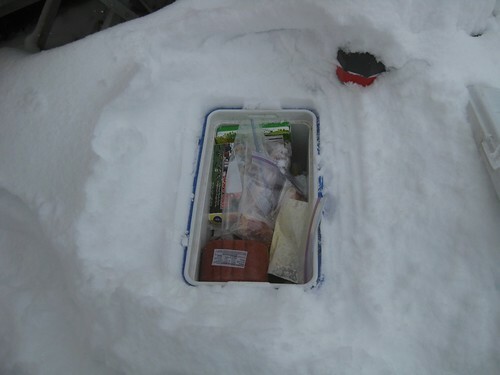 Vegetables left in Hut 1.0 or in coolers outside froze, and stayed that way, helping to keep them preserved. Though, it turns out the best place to have stored my veggies might’ve been in Hut 2.1, where temperatures generally stayed above freezing. I have a cardboard box on the floor which has so far stored the potatoes, onions, 1 head of cabbage, lemons, apples, avocados, tomatoes, asparagus, zucchini, leeks, and winter squashes. All of those veggies are still there (except for the leeks which I used to make potato leek soup last week), and it’s all still good. I didn’t put all my veggies in Hut 2.1 because, I was concerned that they would spoil sooner in the warmer temperatures. In reality, most of the heat rises, leaving the floor at an optimal temperature. The frozen veggies in Hut 1.0 and the coolers outside, on the other hand, may spoil unless it gets colder again and stay frozen (past couple of nights have been mostly above freezing). It also seems clear at this point that I have too much meat. As of this morning, I had consumed a grand total of 6 slices of turkey sandwich meat (leftovers from January), 2 slices of bacon, 2 chicken breasts (1lb total), and 1lb of boneless pork ribs. That’s a little over 2lb of meat in 16 days, and I started with over 11lb of fresh and cured/salted meats. My total fresh meat supply is still far less than the 18lb of meat the average American consumes in a month, but it turns out, as long as I have eggs (of which I’ve so far consumed 22), I don’t need to eat a whole lot of meat. Part of the reason I haven’t been eating meat is because it’s a hassle to prepare in terms of sanitation. After handling and cutting meat, I have to worry about sanitizing the cutting surface, the utensils, my hands, and without a proper sink, that can all be annoying. In general, reducing meat consumption is a rarely cited yet highly effective way to lower our environmental footprint. Meat is problematic in all sorts of ways, whether it’s the waste run-off from industrial feedlots, the increase in methane (a greenhouse gas) cows fart out when they’re on grain-based diets, or the increase in grain production required to feed them. This last point, the increase in grain demand/production, itself has a high environmental cost in terms of water and land usage, pollution of water and soil through agri-chemicals, as well as energy used to grow, process and transport the grain. Let’s also not forget the fact that humans in poorer countries may be competing with cows and pigs in richer countries for the same wheat and corn, contributing to higher grain prices, which in turn lead to malnutrition and hunger, or even political unrest. With all that said, not all meats are equal. Grain-fed beef is the worst offender no matter how you look at it (and the reason I’ve largely removed beef from my diet, excepting grass-fed beef and the occasional lapse), pork is slightly better, with poultry being the most efficient. It takes 2lb of grain to get a pound of chicken, while it takes seven pounds of grain to get a pound of beef (I believe pork is about 3-4lb for 1lb). Naturally, scale also matters. A person who eats a couple of pounds of beef a month will still have a lower footprint than someone who eats 20lb of chicken, though, having cut out beef, I can say that replacing beef with more efficient options like pork and chicken isn’t hard. If you crave a burger, try a turkey burger instead — they’re healthier, and better for the environment. The ultimate, of course, is to become vegetarian or vegan. For me, though, that’s too much of a sacrifice, and when it comes to sustainability, making sure your acts of sustainability are themselves sustainable is also important. After all, my cutting out beef and sticking with it has done far more for the environment, than if I’d tried to become vegetarian but reverted to old habits after a couple of weeks. Speaking of grains, I also over-bought on bread. When I started Project 31, I still had most of a loaf of bread left over from January, and I’m still working on that loaf (which is still perfectly good, by the way). I’ve been mostly eating tortillas and rice, and have only made a few sandwiches this whole time. This also might be a seasonal preference. I know I eat a lot of sandwiches in the summer, since sandwiches don’t require cooking, but now that I have the wood stove and use it every night, cooking a pot of rice on it makes more sense. Though, I also might try and improvise an oven and bake bread using the stove… We’ll see how that goes. Over all, I think this might just be the healthiest diet I’ve kept in a long time. 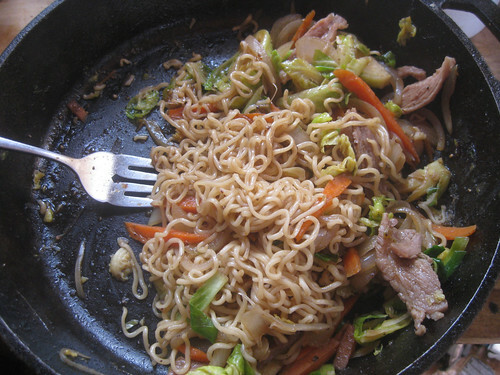 I’m cooking most of my meals, and as you can see from the list, I have very little junk food. My diet has been rich in vegetables, low in meat, pretty low in sugar, and probably lower in sodium than when I eat out a lot. I also eat when I want to eat, what I want to eat, as much (or as little) as I want to eat, which I think is healthier too. Note that “as much as I want to eat” doesn’t mean I eat until I’m over-stuffed; it means I eat until I’m full, instead of eating until my heaping plate is empty. I also generally only eat two meals a day, with snacks of varying sizes thrown in between, which I think helps regulate my own caloric intake to match what my actual needs are. For the most part, I’m not worried about my food supply, though my vegetable selection will likely dwindle in the next week or so. A bout of warm weather could exacerbate that problem as well. 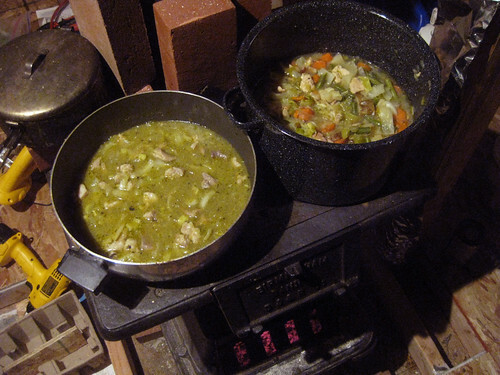 Though, I’m pretty sure I’ll come out of the 31 days with plenty of food left over, so I’m more worried about letting food go to waste than not having enough (which is why I made a giant pot of vegetable soup seen in the photo above, and used another pound of pork to make chili verde also in the photo to the left).